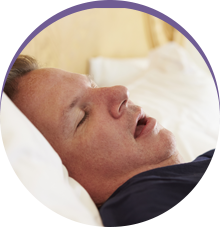 Obstructive Sleep Apnea is a common Sleep-Related Breathing Disorder (SBD) characterized by pauses in breathing or shallow breaths during sleep. During these bouts of shallow or paused breath, those with Sleep Apnea often sleep very lightly, causing them to be tired during the day. There are two different types of Sleep Apnea: Obstructive Sleep Apnea and Central Sleep Apnea. Obstructive Sleep Apnea causes obstructed breathing during sleep, which can also lead to serious health conditions such as high blood pressure, stroke, heart failure, diabetes and other related health complications. Patients with Obstructive Sleep Apnea are excellent candidates for oral appliance therapy. Conversely, patients with Central Sleep Apnea, a more rare type of Sleep Apnea, suffer from a neurological condition that is best treated by CPAP. Sleep Apnea can affect anyone at any age but it is more common in people with certain risk factors. Those that are overweight, have a large neck (over 16-17 inches), are over 40, have a nasal obstruction, or have large tonsils are more at risk of suffering from Sleep Apnea. Often undetected by the sufferer or confused with snoring, Sleep Apnea frequently goes undiagnosed. Since it is a disorder that occurs solely during sleep, those who suffer from Sleep Apnea rarely notice the problem while it is occurring. Instead, they will often feel the side effects the next day in the form of daytime sleepiness or later when they encounter more severe health complications. When breath is no longer obstructed and sufferers once again start to breathe normally, they often produce a snort or choke. These sounds can also be produced when those with Sleep Apnea attempt to breathe at night and the breath is squeezed through the airway. Since these noises sound like mere snoring, they are often considered harmless and Sleep Apnea is left undiagnosed. If you have experienced excessive daytime sleepiness, struggle to breathe during sleep, or have a bed partner who has noticed your obstructed breath while you sleep, you should consider getting tested. Since the symptoms of Sleep Apnea are most apparent while you sleep, the only way to know if you have Sleep Apnea is through a sleep test. How can Sleep Rehab help? 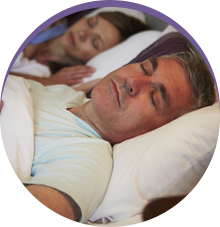 Sleep Rehab offers comprehensive treatment for Sleep Apnea that is non-invasive, non-surgical and non-pharmacologic. When you come to Sleep Rehab, we’ll give you a sleep test to determine your sleep breathing patterns. 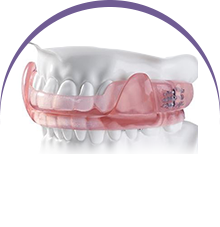 Once we determine the issues from which you are suffering, we will create a customized oral appliance for you. Worn regularly this appliance will eliminate or reduce the effects of your Sleep Apnea. Proudly serving the neighborhoods of Plano, Murphy, Sachse, Carrollton and Dallas.